Peter Parker (Tobey Maguire) has finally managed to strike a balance between his devotion to M.J. (Kirsten Dunst) and his duties as a superhero. But when his suit suddenly changes, turning jet-black and enhancing his powers, it also transforms Peter, bringing out a dark, vengeful side that he struggles to control. He must now battle his inner demons as two of the most-feared villains yet, Sandman (Thomas Haden Church) and Venom (Topher Grace), gather unparalleled power and a thirst for revenge which threatens Peter and everyone he loves. This movie had the potential to be so much more. Three villians which could probably carry a film each get reduced to some few minutes each. Also the sequences where Peter is possessed by the symbiont were ridiculous (going through the streets like an idiot, dancing like an idiot? Is this the aggressive Peter Parker?). This also parallels Superman 3, where Superman is affected by red kryptonite and has behaving unlike his usual self. And to think that there (one of the lesser Superman movies) it was even handled better than in such a critically highly praised franchise as the Spider-Man movies. I also remember how the audience was laughing in the cinema where MJ breaks up with Peter, and Peter started crying. Of course this scene was not intended to be funny. And why do we have to have, just before the showdown, Spider-Man in front of a big American flag? Do the filmmakers still have no idea, that this may be received well to some of the American audiences, but outside of the USA it is just groan-worthy. I hope the next Spider-Man movie is more balanced like the first two were. Absolutely. And concerning the rat, I really liked what I read in a review (probably Empire), that they even made him bonkers like any classic Parisian artist. It's one thing to revolve the story around cooking and use a rat, but to then make him a tortured outsider is just brilliant. It may sound silly, but I think that Pixar are the best and most consistent film studio currently in operation. Everything they touch turns to gold. Have you seen the teasers for Up? That also looks sublime. When are they going to hit the wall? Raimi apparently hated the alien costume and it shows right from the start. Squandered and then rushed, it could so easily have been a two film arc while concentrating on Sandman in this one. But that's only half the excuse for such a complete mess. There is so much wrong with this film, but I think the first was linking Sandman to Ben. Peter's guilt was such a challenging theme for a mainstream blockbuster that to undermine it now is like making Han Solo shoot last. Oh yeah, and Harry's story should have been treated better too. Just awful. Lift off with high-speed, high-flying action in this Ultimate 2-disc Edition that takes you inside the suit of Marvel's invincible Super Hero for the ultimate Iron Man experience! 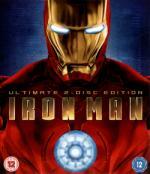 After surviving an unexpected attack in enemy territory, jet-setting industrialist Tony Stark builds a high-tech suit of armour and vows to protect the world as Iron Man. Straight from the pages of the legendary comic book is a hero who is built - not born - to be unlike any other! Another cool superhero movie. Before I have first seen this movie, I only ever heard that there is a superhero called Iron Man, but I had never read any comics or seen any animation series with him. But I enjoyed this movie a lot. My only gripe at first was his imprisonment, where he build his first suit and in all the three months he was there, the captors never noticed that he was not working on their rockets but on something else. But after watching it, I read some stuff on Wikipedia about Iron Man, and it seems they stayed true to the comic's origin story, so I won't hold it against the movie. Robert Downey Jr. plays the part of Tony Stark very well. I mainly knew him from his leading part of the romantic comedy "Only You" before this. Also Jeff Bridges was hardly recognizable. He looks so much different than his other role I know him from: The Dude. But I recognized his voice instantly, when I have first seen this movie (I didn't know then, who exactly was in this movie. I didn't research beforehand. I only knew of Robert Downey Jr.). Thanks for the review Tom... I am looking forward to mine coming. I used to watch the comics all the time... but never really checked out the comics that much. I've Just saw the first two (I even have them ) and they were so awfull that nothing would have made me watch the third one. Spider-Man 1+2 were good superhero movies, in my opinion. I agree... the first 2 were really good. I even enjoyed the 3rd one myself... though it was definitely lacking. The main thing I didn't care for on the Spider-Man movies was so many people seeing him without his mask on. Eh? The comic has been running since the 60s! They have loads of options and Spidey always had interesting villains. I've just been reading an interview with Raimi where he said he's interested in using Morbius The Living Vampire, which might be interesting given his horror background. Then there is The Lizard who is already in the first two (the one-armed Dr. Connors). The Vulture has been mentioned as a possible as well, but I'd like to see a twist on the hunter character (Kraken, I think his name was). They should also draw a line under Mary-Jane and break out the Black Cat! all those characters sounds good to me... and I am sure you won't be surprised... but I would especially like to see Morbius! I liked the first two Spider-Man movies..the third was ok too, but not as good. I thought they crammed a bit too much in, especially as far as Venom was concerned. There wasn't enough time to fully develop that aspect of the story. I've always thought it would have been better to save Venom for a fourth movie..let the black suit stuff go on as set up..but not have Venom pop up until a different movie so there would be more of a story with that. I did read more than once that Raimi didn't want Venom in the movie but the studio insisted because he's been such a popular character. By exemple I really like the first 2 Superman, Supergirl and the Roger Corman's Fantastic Four. It's just that I find that Spider Man is too wimpy in those movies, this is not the hero I remember from the comic I've read when I was young (maybe I'm wrong and he was really like that in the comic too ). Take the dare as never before with this all-new Director's Cut version of Daredevil. Grittier and edgier than the original theatrical release, Daredevil Director's Cut is packed with never-before-available scenes, including a devilish subplot in which Matt Murdock (Ben Affleck) agrees to defend a not-so-innocent man (Coolio) framed for murder. This is the definitive Daredevil — more thrilling, more amazing, and more daring than ever! With Pete talking about Daredevil, I got in the mood to watch this movie again (it has been awhile). Sadly, the studio decided to cut out a complete subplot of the movie, rearrange some scenes and force a love scene into the movie. The result was a mess of a movie, which did not make any sense at all. This director's cut fixes this. Now it makes sense again. If they would have released this version (even if it as 30 minutes longer), I think the movie wouldn't have such a bad reputation! Also the subplot, besides sheding new light into the plot of the movie, provides more scenes for Matt Murdock out of his costume. In the theatrical version this came much too short. Michael Clarke Duncan was a great casting choice to be the Kingpin. I know, that a lot of purist do not think so, as he is an African-American, which the Kingpin of the comics was not. But I think he fits perfectly. Kingpin is supposed to be a big fellow who's big build is thanks to his muscles. And that Michael Clarke Duncan can provide. Before this movie, I didn't know much about Daredevil. I must confess, I have never really read a superhero comic. So most things I know of the superheroes is from movies and TV, and some Wikipedia research after I watched such a movie.